Beacon technology have made its own impact on almost every industry especially the retail sector. Inspite of its complex infrastructure and platforms beacons offers an efficient way for marketers to interact and target customers in physical and ideal locations. Mobile apps integrated with this technology behaves like virtual guides providing more useful functionalities. Beacon technology have provided unique ways to engage with customers such as customer service and promotions. Beacons are small and wireless sensors that uses Bluetooth Low Energy to broadcast radio signals to communicate with other smart devices. Almost every sector including retail, educational institutions, travel and finance make use of this technology to track and communicate with potential and existing customers. In this case, a beacon is fixed to wall of event location or any public place where communication is easy with a corresponding mobile app to locate where exactly the person is currently located with great accuracy. Depending on the closeness of the customer personalized communication takes place. How Beacons engage and encourages shoppers? Goal of a retail sector is to provide good user experience and Beacon solutions will help retailers in achieving this. Beacons can easily figure out loyal and interested customers, customer’s current location and things that they are likely to purchase when they enter into the store. Beacons in retail apps give customers valuable information about sales and promo offers depending on the surroundings. 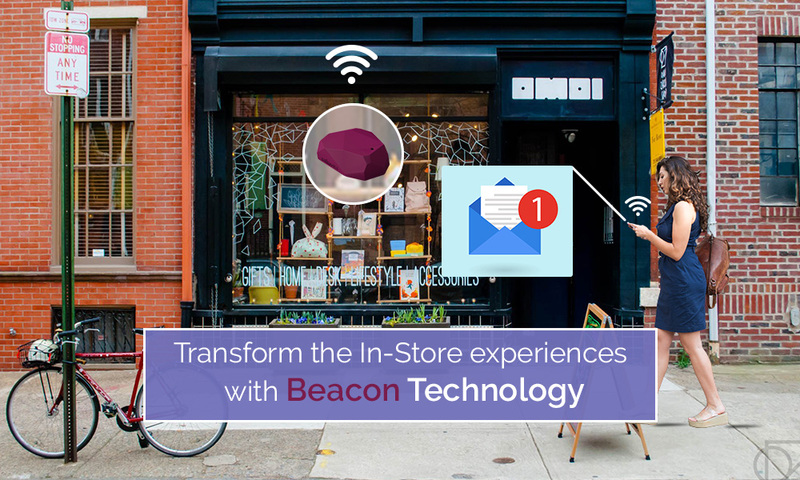 Retailers can use these Beacon solutions to improve shopping experience by sending consumer data to retailers or the other way round. Retail beacon sends a unique signal to the device. Customer’s smartphone with the retail app receives the signal. Retailer’s app with beacon technology sends the signal on to the online platform. This platform instructs the app to perform action. Customer now finally receives the message regarding offers and product information. So make sure that once your store is ready with beacon, inform your customers to download the app by offering them app exclusive deals. Once the app is installed beacons can deliver message to your customers. Let customers know about beacons by putting a beacon symbols around your store, conduct interactive campaign and share it over the social networks so that everybody know about it!! Increases customer engagement: Beacons encourages a shopper to step into the store and do shopping. Once they are into the store they receive messages regarding clothing items. Based on the shopping activity, beacons send promotion deals, reward points and pop-up alerts to the customers. It provides complete description when the shopper approaches to the particular product. Accessing data: Depending on the purchase history and preferences retailers gather sensitive customer data. Data includes analyzing what day of the week or what time of the day shoppers are more likely to use coupons and data about what else products are purchased in a single go. Cashless transaction: Most of the people avoid carrying wallets with them and prefer payments using their smartphones. Beacon based payment apps are accessible to any smartphone user without being device specific. They offer secure, easy and quick payment solutions. Retailers can make use of TruBeacon a service platform that helps to manage, engage and provide payment options to the shoppers. Businesses can get huge benefits from the devices like beacons. It surely creates customer engagement and improves brand exposure. If you want to develop a retail app and improve the revenue of your brand then visit FuGenX Technologies. FuGenX is one of the award winning best mobile app development companies in India with highly experienced developers who develop top-notch apps irrespective of the industries.